Internationally known as Africa’s “Iron Lady,” President Ellen Johnson Sirleaf is a leading promoter of peace, justice and democratic rule. She grew up in the Liberian capital of Monrovia, where she married and had four sons. She served as the Chairperson of the Governance Reform Commission of the National Transitional Government of Liberia until she resigned in March 2004 to accept the nomination of the Unity Party of Liberia as the party’s leader. In November 2005, President Ellen Johnson Sirleaf was elected President of Liberia and became the first woman to lead an African nation. In the elections she defeated popular world-class soccer star George Weah with an impressive 59.4 percent of the vote. 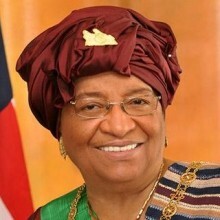 In October 2007, President Ellen Johnson Sirleaf was award the Presidential Medal of Freedom, the United States’ highest civil award, for her personal courage and unwavering commitment to expanding freedom and improving the lives of people in Liberia and across Africa. And in 2010, as the only female and African Head of State, President Ellen Johnson Sirleaf was named by Newsweek Magazine as one of the World Top Ten Leaders.